Nowadays people tend to eat much and to move less. Giant restaurants and eating places are here and there everywhere and all of them allure people to taste their foods with their peculiar and exotic flavours. The result is a big rise in the number of people who suffer from obesity, high blood pressure and diabetes. This has led to a rise in awareness in what to eat and how to eat. Consumers, nutrients and food producers started counting the calories each kind of food contains; the goal is to satisfy the body's needs in energy and calories without gaining much weight. There are so many types of unprocessed and natural foods that can both satisfy the body's needs and keep the danger of gain weighing away. Here are a few examples of them. 1- Eggs: Eggs are rich with protein. They help you feel full for a longer time. A research has found that having two scrambled eggs reduce the desire for food for the next 36 hours. Also, protein can prevent spikes in blood sugar which can lead to food carvings. 2- Beans: Cholecystokinin is one of the efficient weight-loss stimulants. It is a natural appetite suppressant. People who eat beans tend to a have a less desire for food than those who eat a low-fibre meal. 3- Salad: Salad is a purely natural nutritional element. Studies have proved that starting your meal with a huge salad lessens your desire for food.42 women at Pennsylvania State University underwent an experience of having a low- calorie salad. The result is that they consumed 12 per cent less pasta afterwards even though they were provided as much as they want. 4- Green tea: Green tea pure or mixed helps people lose weight and increase their metabolism. 5- Pears: Pears are very good at filling you up, and apples also, include pectin fibre which reduces blood-sugar levels helping you avoid between-meals snacking. 6- Soup: A study has shown that soups satisfies cravings for food, because your mind ''and stomach'' feels you can not eat more. 7- Lean Beef: Eating a well-calculated amount of beef a day on a roughly 1.695 calorie diet helped women lose more weight, more fat and fewer muscle. Also have less hunger pangs. 8- Olive Oil: Olive oil is a monounsaturated fat that will help you burn calories. An Australian study on twelve women aged 56 to 72 who were given a breakfast that includes olive oil and skim milk undergo a great boost in their metabolism. 9- Nuts: Despite the fact that nuts can be fattening, studies showed that people who snack on other things tend to gain more weight. Also another study showed that a number of normal-weight people added about 690 calories worth of peanuts to their diet regime, they eaten fewer at subsequent dishes. 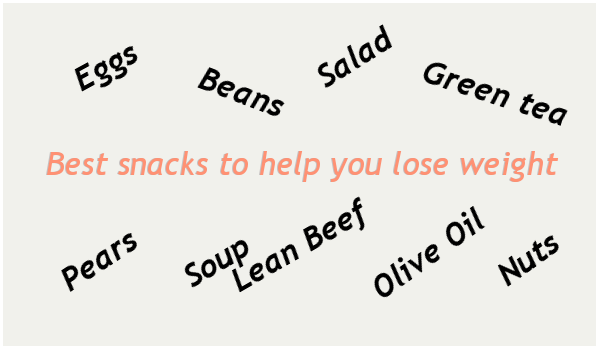 These are just a few examples of snacks that can help you lose some extra weight. However, practising sports at a regular basis is also a key factor in keeping fit.